Juncker says the trade agreements his Commission has sought around the world are 'often called into question wrongly'. He says pooled sovereignty means he can go to trading partners and defend the interests of 'an open continent but not one that we'll hand over'. Juncker raises EU voters' disillusionment ahead of next year's EP elections. Says EU must 'get across the evidence to our citizens that when we act together the EU can achieve results'. Proposes new single use plastics ban and ending Daylight Saving Time will achieve this. Juncker says he's proposing 'a new alliance between Europe and Africa, an alliance for investment and sustainable jobs'. He says this will create 10 million jobs in Africa over the next five years. Juncker says: 'We agree with the statement made in Chequers that the starting point for such a partnership should be a free trade area between the UK and the EU.' Warning: The EU and UK have *very* different ideas about what a 'free trade area' actually entails. 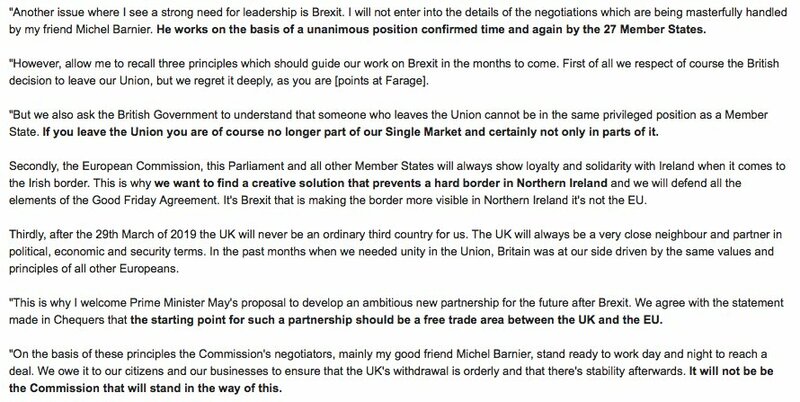 Juncker's statement on Brexit. He bristles at suggestions the Commission are being hardliners standing in the way of the UK and Member States sealing a deal. He trashes the economic part of Chequers and puts the blame squarely on the UK for the Irish border and risk of no deal. Juncker gets two big rounds of applause by proposing to do away with the requirement for unanimity of Member States in the areas of foreign policy and taxation, allowing the EU to legislate by QMV. Neither has a hope in hell of getting past national capitals, you'd have thought. Juncker thanks MEPs for applauding sections of his speech because 'that gives me an opportunity to drink'. Some laugh in a nod to J-C's long rumoured fondness for alcohol. To be fair he takes it in good humour and grins along with them. Clear message to Hungary: 'Commission will resist any attack on Rule of Law & we continue to be very concerned by developments in some of our Member States. Article 7 must be applied whenever the rule of law is threatened.' MEPs, expected to vote for A7 trigger later, lap it up. Commission no deal planning only pledges to 'avoid full interruption of air traffic between the EU and the UK' and will 'only ensure basic connectivity'. Not terribly encouraging wording for those with holiday plans in Europe after March. Also in the document is confirmation Gibraltar will be carved out of any measures to mitigate a no deal scenario. Will go down like a cup of cold sick on the Rock and in London. Dutch PM Mark Rutte tells me: 'This idea in UK Parliament they’ll get stuck in backstop for 30/40/50 years is absolutely not necessary. Nobody in his right mind would want the backstop.' Adds he's 'confident May now has all the arguments necessary to get it through parliament'. Rutte denies suggestions May was too vague during talks with EU leaders last night: 'She was very clear, very open about what she wants from us and we put it on paper' [in the EU27 summit conclusions]. 1. As media had previously reported #Juncker decided not to focus on what his Commission achieved but on what still needs to be done to convince European citizens to say 'Yes' to the EU when they go to the polls next year. 2. I agree that it is not a good moment for pats on the back and I agree with #Juncker that member-states have in many respects held the Commission up from delivering on Commission's promises. Big takeaways: the most innocent explanations for L'Affaire Russe are no longer credible, and the most damning explanations have not been ruled out. Or to paraphrase @NateSilver538: "Pee tape." Anyway, thanks to the @FiveThirtyEight crew for giving us the kick in the pants to actually write this!